Prince Mohammed was still in his early teens when he began trading in shares and property. And when he ran into a scrape or two, his father was able to take care of things. Unlike his older half-brothers, MbS, as he is known, did not go abroad to university, choosing to remain in Riyadh where he attended King Saud University, graduating in law. Associates considered him an earnest young man who neither smoked nor drank and had no interest in partying. In 2011, his father became deputy Crown Prince and secured the prized Ministry of Defence, with its vast budget and lucrative weapons contracts. MbS, as a private adviser, ran the royal court with a decisive hand after his father was named Crown Prince in 2012. Every step of the way, Prince Mohammed has been with his father , who took his favoured son with him as he rose in the hierarchy of the House of Saud. Within the Saudi religious and business elite it was well understood that if you wanted to see the father you had to go through the son. Critics claim he has amassed a vast fortune, but it is power, not money, that drives the prince. When Salman ascended the Saudi throne in January 2015, he was already ailing and relying heavily on his son. Aged 79, the King is reported to be suffering from dementia and able to concentrate for only a few hours in a day. 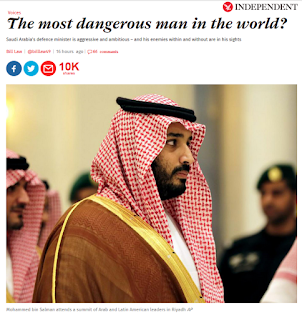 As his father’s gatekeeper, MbS is the real power in the kingdom. That power was dramatically increased in the first few months of Salman’s rule. Prince Mohammed was appointed Defence Minister; put in charge of Aramco, the national energy company; made the head of a powerful new body, the Council for Economic and Development Affairs with oversight over every ministry; and put in charge of the kingdom’s public investment fund. He was named deputy Crown Prince but ensured ascendancy over his rival Mohammed bin Nayef, the Crown Prince and Interior Minister, by absorbing the latter’s royal court into that of the King’s. Impatient with bureaucracy, MbS has been quick to make his mark by demanding that ministries define and deliver key performance indicators on a monthly basis, unheard of in a sclerotic economic system defined by patronage, crony capitalism and corruption. His sudden early morning visits to ministries demanding to see the books is rapidly becoming the stuff of legend, startling sleepy Riyadh into action and capturing the admiration of young Saudis. “He is very popular with the youth. He works hard, he has a plan for economic reform and he is open to them. He understands them,” enthused one businessman. That counts, because 70 per cent of the Saudi population is under 30 and youth unemployment is running high, with some estimates putting it at between 20 and 25 per cent.